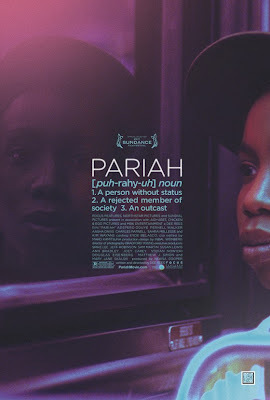 Reel Talk Online: Early Review: "Pariah"
Rarely do we get to see a provocative coming-of-age story with an African-American lead. Less rarely do we get to see one where the lead is a lesbian black female. Although Pariah is both, it plays to neither. 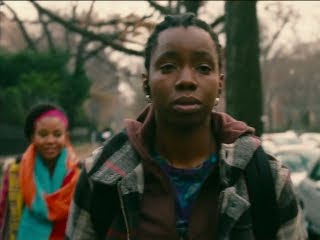 Adepero Oduye plays the shy seventeen-year-old Brooklyn high school student Alike (pronounced Ah-lee-kay), who is on the verge. She's on the verge of graduating. She's on the verge of adulthood. And, she's on the verge of coming out. She's looking for love, the kind of love that seeped out of her parents' home years ago when their relationship began to crumble, the kind of unconditional love she wish her mother had for her, the kind of love she doesn't have to be ashamed about. But mostly she's looking for self-love. Alike has one friend, Laura (Pernell Walker), an out lesbian who had a similar home life before her mother kicked her out of the house after she found out about her sexuality. Laura encourages Alike to come out her shell, but Alike realizes that, as far as personalities go, they're not very similar. Alike likes open mic night and house parties with underground music. Laura likes dance clubs and hip-hop. When Alike meets the free-spirited Bina (Aasha Davis), she thinks she's finally found someone who gets her, someone with whom can really be herself. This moment becomes perhaps one of the most defining moments of her adolescence, a moment that opens the door to the rest of her life. Writer/director Dee Rees tells a beautiful semi-autobiographical account of her own coming out experience as an intern on the set of Spike Lee's heist flick, Inside Man. She recalls scribbling notes about her soon-to-be film on the set to The Hollywood Reporter: "The script was, kind of, a catharsis to what I was going through." It became a short film in 2006 and this year a Toronto International Film Festival darling on the way to theaters on Christmas day. Each actor in the movie brilliantly captures her story of love, happiness, forgiveness, and friendship. Oduye is so lovely as Alike. She plays her so sensitively and relatably. She makes Alike someone you root for, laugh with, and cry with. Oduye fully embraces her character warmly, something the character herself was seeking throughout the movie. Hopefully the academy will recognize both her and Dee Rees come awards season. The usually hilarious Kim Wayans, who plays Alike's uptight church-going mother, is absolutely unrecognizable in the role. Gone are her witty banters and over-the-top performances. Save for one particular scene, her performance is threateningly quiet. But, really, every performance in the movie, including that of Walker, Davis, and Charles Parnell (who plays Alike's dad) is one to be savored. Each character is so real, like someone you may know, which makes Pariah a real comfort. Thanks for the early word on this one. It's going on my list. Sounds great. I remember reading a few things about this awhile back. Your review is wonderful, I hope it comes to a theater near me! Great review. Will keep a lookout for this one. Great review. It took me a while to get to this one, but I'm really glad that I did. Oduye and Wayans were particularly good in this, and I'm looking forward to Dee Rees' next projects.